These small religious items pack a big spiritual punch that can protect your family. The use of sacramentals is one of the most misunderstood practices in the Catholic Church. They have been part of the Church’s life from the very beginning, but are commonly viewed as some sort of superstition. This is largely due to the fact that many Catholics over the centuries have used sacramentals in a superstitious way as they were not taught how to use them properly. Instead of using them with faith, some Catholics used them as magic charms rather than instruments of grace. This is unfortunate, as sacramentals are meant to enrich our spiritual lives, not hinder them. They have been instituted by the Church to draw us into a deeper relationship with Christ and are focused on sanctifying every part of our lives. Sacramentals are extensions of the seven sacraments and bring the grace of God into everything that we do. One place where sacramentals are especially powerful is in the home. If used in a spirit of faith, sacramentals can protect us from spiritual harm or inspire us to live a holy life dedicated to God. Here are three such sacramentals that, if used properly, can provide a spiritual boost to the home as well as keep away spiritual enemies that are lurking in the shadows. Holy water has a double meaning of reminding us of our baptism as well as a symbol of spiritual cleansing. Holy water is said to have great power over the devil as the devil cannot stand this “clean” water, since he is entirely unclean for all eternity. It is a reminder of the water that flowed out of Christ’s side, which is a symbol of Baptism, and brings to mind the day of the devil’s defeat (Christ’s crucifixion). It is an ancient custom to have what are called “holy water stoups” or “holy water fonts” on the walls of a home. They are elaborate or simple cups that hold holy water, which can then be used to bless oneself throughout the day. It is especially helpful to have them at the doors that lead outside the house as well as in the bedrooms of family members. That way we keep ourselves always fixed on Christ and remind ourselves to remain pure. It also keeps the holy water handy when needed to ward off any influence of the Evil One. If possible, it is also good to have a small container of blessed salt in your home. You would have to specifically ask your parish priest to provide that for you and odds are likely that your parish priest would not be familiar with it. This is one sacramental that is often neglected and is not typically used in parishes. However, it is a powerful weapon against evil as can be seen by the following portion of the blessing said by the priest found in the Roman Ritual. Almighty and everlasting God, we humbly implore you, in your immeasurable kindness and love, to bless (+) this salt which you created and gave to the use of mankind, so that it may become a source of health for the minds and bodies of all who make use of it. May it rid whatever it touches or sprinkles of all uncleanness, and protect it from every assault of evil spirits. Through Christ our Lord. Another very powerful sacramental that is more typically found in our homes is the crucifix. Not only does a crucifix remind us of the great love that God had for us, but it also is a strong deterrent to spiritual enemies. The crucifix is the bane of Satan’s existence and is the sign of everything that he despises. It is beneficial to have a crucifix in every room in your house (or apartment) so that you can frequently meditate on Jesus’ great sacrifice of love as well as have an image to remind you what you need to focus on during times of temptation. Here are two prayers of blessing a crucifix in the Roman Ritual which sum up all the reasons we need them in our homes. Holy Lord, almighty Father, everlasting God, be pleased to bless + this cross, that it may be a saving help to mankind. Let it be the support of faith, an encouragement to good works, the redemption of souls; and let it be consolation, protection, and a shield against the cruel darts of the enemy; through Christ our Lord. Lord Jesus Christ, bless + this cross by which you snatched the world from Satan’s grasp, and on which you overcame by your suffering the tempter to sin, who rejoiced in the first man’s fall in eating of the forbidden tree. Here it is sprinkled with holy water. May this cross be hallowed in the name of the Father, + and of the Son, + and of the Holy + Spirit; and may all who kneel and pray before this cross in honor of our Lord find health in body and soul; through Christ our Lord. Philip Kosloski is a husband and father of five, and staff writer at Aleteia. He also writes for The Pope’s Worldwide Prayer Network (Apostleship of Prayer). What is it with Pat Gannon and the Catholic Church? Truth hurts I guess. After reading about the crucifix, I started to think and realized that I actually do have a crucifix in every room of my house. Living room, dining room, kitchen, and three bedrooms. Never thought about it before. But there they are! I actually do have a crucifix in every room of my house. Living room, dining room, kitchen, and all three bedrooms. Never really thought about it before, but there they are! You need to be reminded of what Jesus did for you. That’s why you need to have a crucifix where you can see it. Pat, the sacrifice of Christ on the cross can never be undermined. Be polite about things you know nothing about and ask questions .Venerating the cross is one of the biggest form of appreciation and respect for the price Christ paid. The crucifix is to remind all of us of the sacrifice Jesus made for us. Dear Pat. For someone who clearly despise the Church you surely love too read and check up on what the Church has to say. We understand that you left the Ark(Church) for whatever reasons and hope you find joy and happiness where – ever you are? But please, stop with the hating because the Church(Catholic) will still be here long after the both of us is gone and She will continue to teach Her children in all truth as given through the Holy Trinity. “My sheep knows my voice and they follow me” The Good Shepherd, Jesus Christ Our Lord and Saviour. I’ve seen some of your comments and to me you sound like a ravenous wolf intend on only attacking and destroying that which does not belong to your pack, sound familiar, Matthew 7. 15. Remember God loves you and paid the price of Salvation for you Pat on the Cross of Suffering at Calvary, the cruxified Jesus Christ. God bless you John. I pray that I can explain our faith the way you do. Re: Blessed salt Is this the regular salt and then being blessed? @Betsy Yes, it is. But first ask any priest in the Church if he knows about this. If he doesn’t, ask if he knows another priest who does. May the Holy cross be our light Amen. Cruz sacra sit mihi lux. Your comment is, well, stupid. Obviously, you are not a practicing Catholic. I agree with your commment Dolores. How sad. The reason behind having it up is what you say and others. I have 3 crucifix hanging in our place and meditating on them makes me love Him even more. As a Stephen’s Minister & Hospice Nurse, I bring a crucifix for them to hold, as they like to see their sweet Jesus to offer Him their sufferings. Depending on time.. I say the Jesus prayer & the Divine Mercy main prayers. 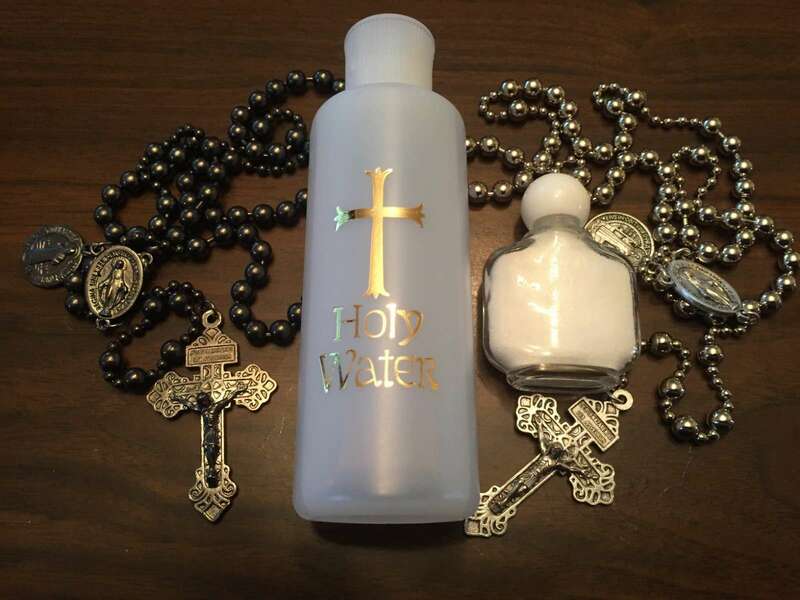 I use holy water & holy oil & a Rosary. I always offer & try hard to get a priest there first so they can receive the Sacrament of Reconciliation & Communion. It is my prayer that I have someone like you to assist me in my dying process when it is my time. God bless you Eileen! (I am a nurse too and say a Divine Mercy prayer to my dying patients). The crucifix is a powerful weapon against the evil one, because it reminds him of how Christ defeated him and saves souls from his grasp. It reminds Christians of how much Jesus loved us to the point of suffering and dying for us, so that we can live with Him in all eternity. We are all called to carry our cross as Christ did for Love of others. Selfless living for others. Jesus tells us, “There is no greater love than to lay down one’s life for his friends. We, Christians , gaze upon the crucifix with love and thanksgiving for Christ’s love and sacrifice for us. He wants to be your friend, as well. Read the gospel of John and God Bless you. Blessed salt is sprinkled around the four corners of the house rooms etc. to chase a evil spirits. A lot of it is sprinkled in the garden since the salt gets absorbed in to the soil. Exorcist priest are known bless salt with special prayers. You can consume a grain or two as well. That’s the message you get if you’re a non-believer. You shouldn’t mock what you don’t understand. The least thing you can do is respect another Chrsitian’s religion. Having a bare cross isn’t? Your argument is flawed. Pat why must you be sarcastic and cynical? I don’t know what you believe or practice but please respect what you read and don’t make such ridiculous comments. If you don’t like and/or agree with it don’t comment and scroll on. You’re disrespectful and rude. To Pat, Jesus doesn’t need any reminder…we all are the ones that need to remember the price our savior paid for our salvation! Salvation is not free it was paid on the cross by Christ blood. Love and peace brother. May God bless you. Pat Gannon, Please don’t talk about what you don’t know. Jesus does NOT think like us. He is the Lord the Messiah, Savior, Deliver and does not have your human mind. Think not for the Lord with your feeble sense. True….and the bible says that God is spirit so we worship Him in Spirit and in truth. No need for any material stuff if we need help from Him. Just call and He is with us. Bible said ask and you receive seek and you find knock and it shall be opened into you. You do not receive becoz you do not ask. He /God is not only God but also our Father and Jesus said whatever you ask the Father in my name He will give it to you. Shirley, what is truth? Truth is a fact. You can see, you can hear, you can touch, as log as it exists on earth. What is spirit? Exactly the opposite of truth; cannot be seen, cannot be heard, cannot be touched. I experience heavy spiritual warfare. The only relief I have found has been through reciting prayer, scripture, using Holy Water, and asking Mary’s help. If anyone is experiencing strange harassment, try this.